The SUN Fire V890 was offered in two versions, the "2100" and "A53." The A53 version supported up to (8) UltraSPARC IV+ 1.8 GHz CPUs (2 per CPU Board) while the 2100 version supported up to (8) 2.1 GHz CPUs across (4) CPU Boards. (12) Fibre Channel Disk Modules can be installed in the front hot-swap bays when an optional (6) bay expansion backplane is installed. 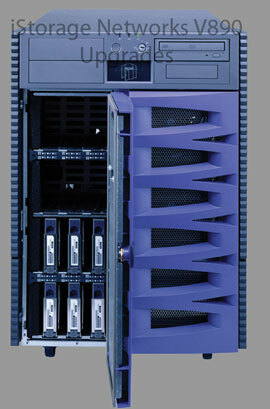 Contact us to learn about trading in your low capacity SUN disk drives for 300GB units. We will help you determine if you are running the required HBA firmware revisions and Solaris Patch Releases to support 300GB disk drives in your V890. We can offer up to a $75 per drive credit for each drive you trade-in.